On the face of it, this might look like a vintage-style evening bag, but it’s actually something modern – and eco-friendly. 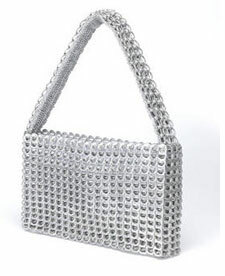 As the name suggests, this Aluminium Ring Pull Bag is made of recycled aluminium ring pulls, specifically by a co-operative of Mexican women. All the tabs are crocheted together and the bags are full lined. Which makes the bag a talking point as well as a rather stylish accessory. Sized at 16 x 26 x 5cm, you can pick one up for £65.